Hey there designers! 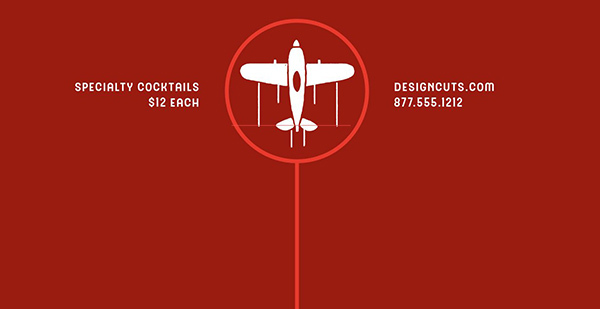 Renee here with a tutorial for a cocktail menu. We’ll use both Photoshop and Illustrator to bring this piece to life. 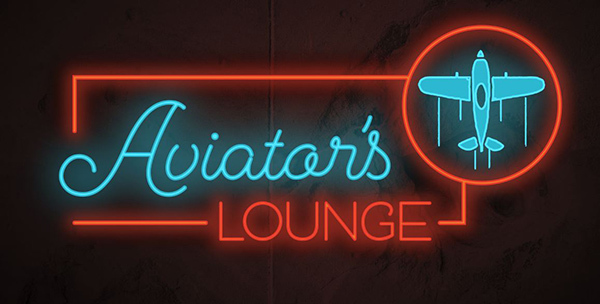 We’ll learn how to create a realistic neon effect and make a vintage-style cocktail listing. The freebie pack includes ornaments and icons from Fenotype, Latinotype and Vintage Voyage Design Co. This freebie pack is just a small sample of the showstopping fonts available in The Definitive Font Selection for just $29 (that’s an incredible 99% off). 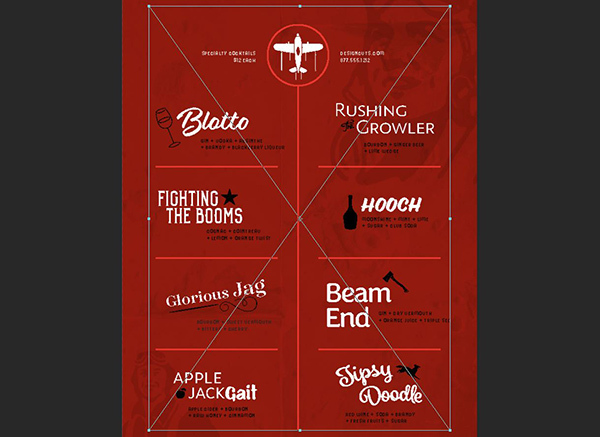 Stand out from the crowd when you use this incredibly diverse collection of fonts. We’ll be using a photo by Samuel Zeller available on Unsplash. Download it here. Open Illustrator and go to File > New. In the New Document dialog box, enter a document name, a width of 8.5 inches and a height of 11 inches. Under Bleed, make sure the link icon on the far right is selected (to apply our input to all four sides) and enter a Top bleed of .125 inches. Under Advanced, select a Color Mode of RGB. Select your Type Tool (t). 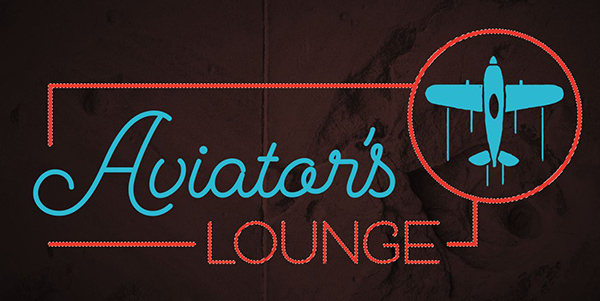 Click once on the artboard and type: Aviator’s. Open your Character palette (Window > Type > Character). Change the font to Cosmopolitan Script Medium at 105 pt. Open the Color palette (Window > Color) and enter RGB values of 18/188/213. Open your Swatches palette (Window > Swatches) and click the New Swatch icon at the bottom of the palette. When the pop-up appears, press OK to add the teal swatch to the Swatches palette. Select your Type Tool again. 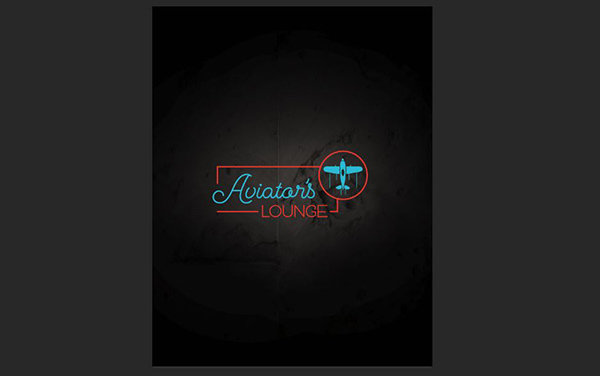 Click on the artboard under Aviator’s and type: LOUNGE. 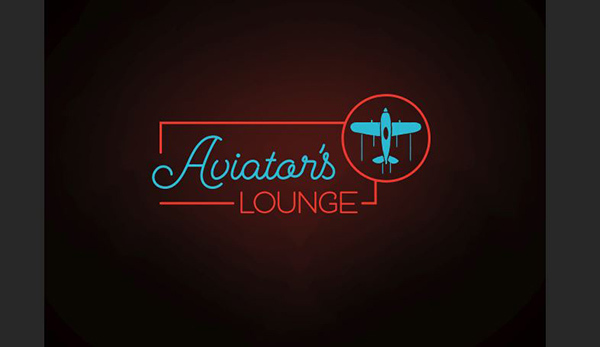 Position so the top of the L in LOUNGE points between the “a” and “i” in Aviator’s. In the Character palette, change the font to Cosmopolitan Sans Bold at 60 pt. In the Color palette, enter RGB values of 235/50/36. In the Swatches palette, click the New Swatch icon, then click OK on the pop-up dialog box. 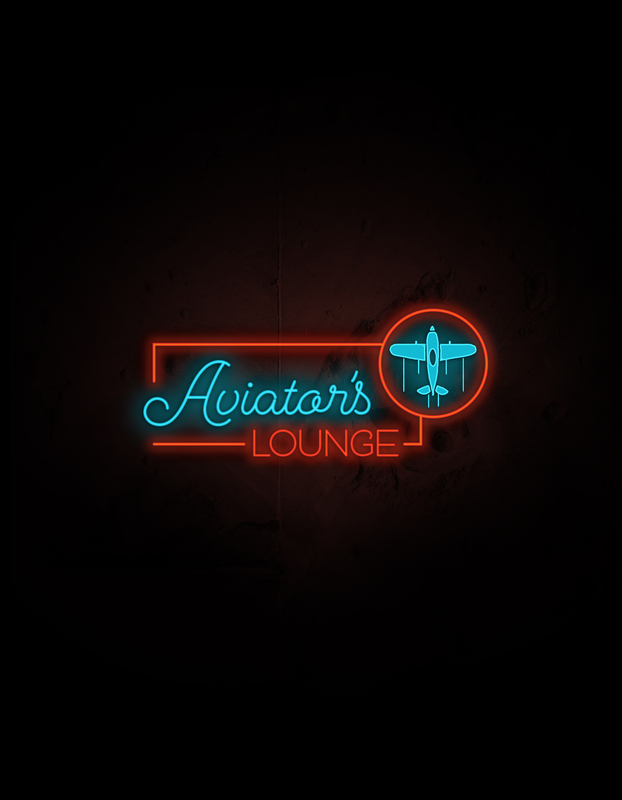 Since we’ll be creating a neon light effect, I’d like to make the Lounge text a little bolder. Open the Stroke palette. Next to Weight, click the downward arrow on the right of the text field and select .75 pt. Open the Swatches palette and click on the black Stroke thumbnail behind the red Fill thumbnail. Now click the new Red color swatch. 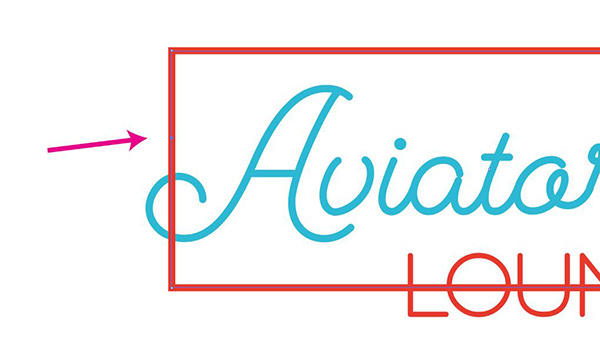 Before we move to the next element of the logo, let’s tighten up the area around the apostrophe on Aviator’s. 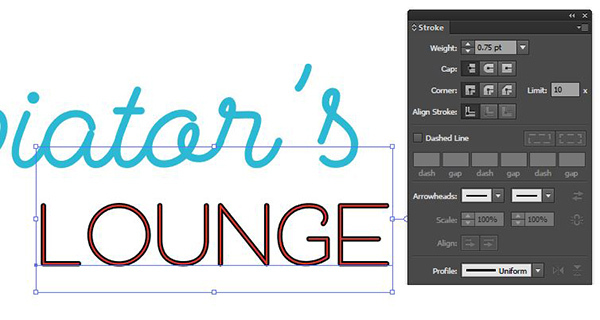 Use your Type Tool to select the “r” before the apostrophe. In the Character palette, change the Tracking to -102. Now use the Type Tool to select the apostrophe. In the Character palette, change the Tracking to -70. Select your Rectangle Tool (m). Click once on the artboard. In the pop-up dialog box, enter a width of 3.75 inches and a height of 1.4 inches. Press OK. Position on the artboard so the bottom edge of the rectangle bisects LOUNGE and the left edge cuts through the middle of the loop on the capital A in Aviator’s. Open the Swatches palette. For the Fill color, select None (white square with a red slash). Click the Stroke thumbnail and select the new Red color. In the Strokes palette, increase the Weight to 3 pt. Next to Cap, choose the icon for Round Cap. Select the Ellipse Tool. Click once on the artboard. In the pop-up box, enter a Width and Height of 1.5 inches, then click OK. Position the circle at the top right of the rectangle. Select the main Selection Tool (v). Click once on the rectangle to select it. Switch to the Pen Tool (p). 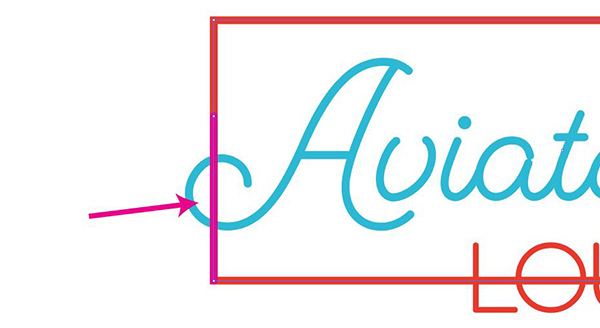 Click once on the rectangle just above the loop on the A in Aviator. Switch to the Direct Selection Tool (a). Select the line segment between the point we’ve just added and the bottom left corner point. Change back to the Pen Tool (p). 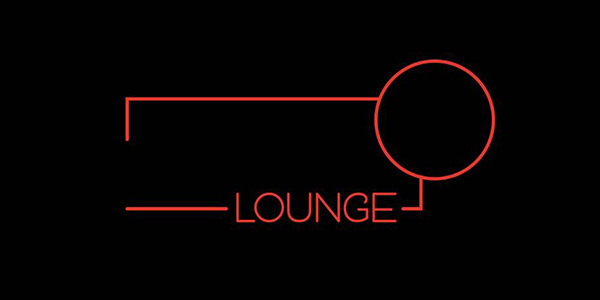 Click on the line to the left of LOUNGE and then to the right of LOUNGE (equal distance on each side). Use the Direct Selection Tool (a) to select the line segment between the points and press Delete. Switch to the main Selection Tool (v) and click on the top right section of the rectangle to make it active. Press Shift + Cmd + ] (right bracket) to bring the rectangle section to the front. Change to the Pen Tool (p). Click once on each of the two places where the circle intersects the rectangle. Select the Direct Selection Arrow (a). Select the top right point on the rectangle and press Delete. For our last step in the logo, we’ll add a plane icon. Select the Type Tool (t). Click once on the artboard inside the circle and type lowercase c.
In the Character palette, change the font to Aviator Elements at 134 pt. Note: If you haven’t purchased the font pack, this is available in the Freebies folder under VintageVoyage_AviatorElements. In the Swatches palette, select the Teal swatch for the Fill color. Open Photoshop and go to File > New. In the New Document dialog box, enter a Width of 8.75 inches and a Height of 11.25 inches. Enter Resolution of 300 ppi and use RGB Color Mode. Click OK to create the new document. Go to File > Place Linked and navigate to the photo downloaded from Unsplash. Press Place. Hover over one of the corner handles until you see the double-sided, rounded arrow. Hold Shift and rotate the image 90 degrees to the left. Continue to hold Shift, but this time use the corner handle to increase the size of the image until it fills the entire artboard (it’s ok for it to be larger than the artboard). Press Enter. At the bottom of the Layers palette (Window > Layers), click the Create A New Layer icon. Double click the name of the layer and rename it Black Fill. Press D to set your Foreground Color to black and Background Color to white. Press Opt + Backspace to fill the layer with the Foreground Color, black. We’re going to copy sections of our logo into the Photoshop file separately so we can manipulate them individually. 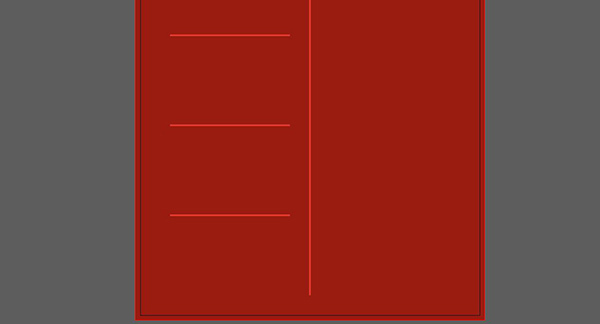 In Illustrator, hold Shift and use the Selection Tool (v) to select all of the red parts of the logo (rectangle segments, circle, LOUNGE). Press Cmd + C to Copy. Go back to Photoshop and press Cmd + V to Paste. In the pop-up dialog box, select Smart Object and click OK.
Press Enter to complete the placement. Go back to Illustrator and select Aviator’s. Press Cmd + C to Copy. In Photoshop, press Cmd + V to Paste. Select Smart Object in the pop-up and click OK. Use the Move Tool (v) to position the word correctly inside the rectangle, then press Enter. 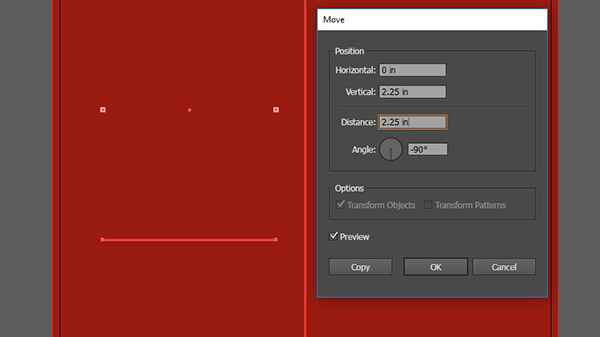 In Illustrator, select the plane and press Cmd + C to Copy. In Photoshop, press Cmd + V to Paste, select Smart Object and press OK. Position the plane inside the circle and press Enter. 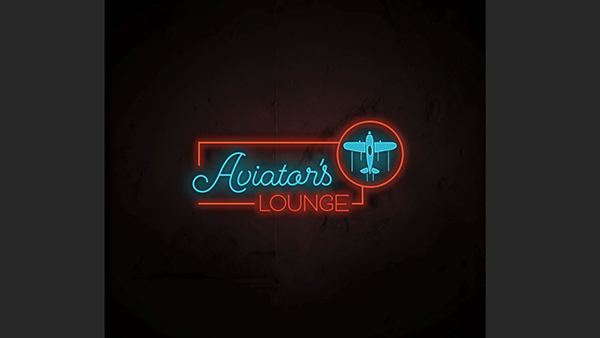 In the Layers palette, double click on each layer name of the three Vector Smart Objects and change the names to Logo Outline, Aviators and Plane. Click once on the Black Fill layer to make it active. At the bottom of the Layers palette, click the Add Layer Mask icon. Switch to your Brush Tool (b). At the top left of the artboard, click the brush thumbnail to open the Brush Preset Picker. Select Soft Round. To the right of the brush thumbnail, change the Opacity to 15%. Press the right bracket key (]) several times to increase the size of the brush to about 2000 px. Brush over the logo area. As you brush, you’ll see the background texture start to peek through. Only brush once or twice to keep it subtle. At the bottom of the Layers palette, click the Create A New Layer icon. Double click the name of the layer, Layer 1, and rename it Red Background. Drag this layer below the Black Fill layer. Click on the Foreground Color swatch at the bottom of the toolbar to bring up the Color Picker. Hover over the artboard (off the Color Picker) to automatically activate the Eyedropper. Click on the red part of the logo to sample the color. Press Opt + Backspace to fill the Red Background layer with the Foreground color. At the top of the Layers palette, change the Blend Mode to Multiply and the Opacity to 60%. 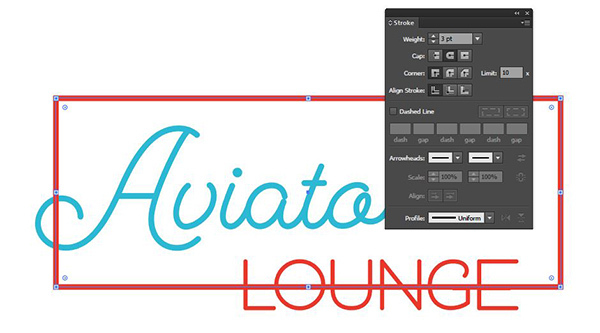 In the Layers palette, select the Logo Outline layer, then hold Shift and select the Plane layer. With all three layers of the logo selected, press the Create A New Group icon at the bottom of the palette. Double click the name of the new group, Group 1, and rename it Logo. Click the Create A New Group icon again and name this group Highlights. In the Logo group, hold Cmd and click once on the thumbnail image on the Logo Outline layer to create a selection around it. Go to Select > Modify > Contract. In the pop-up, enter 4 px and press OK.
Click the Foreground color swatch at the bottom of the toolbar. In the Color Picker pop-up, enter RGB values of 237/112/28. Press OK. In the Layers palette, click once on the Highlights group, then press the Create A New Layer icon to create a new layer inside the group. Name this layer Logo Outline Highlight. With the new layer active, press Opt + Backspace to fill the selection with the orange Foreground color. Press Cmd + d to Deselect. Click the Create A New Layer icon. Name the new layer Aviators Highlight. 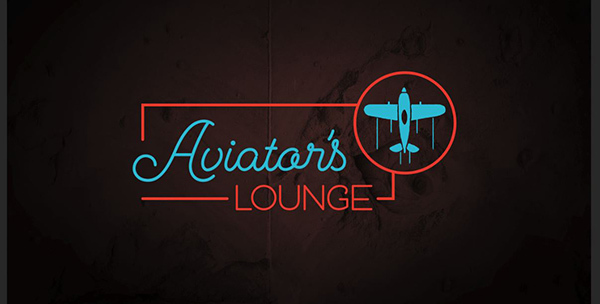 In the Logo group, hold Cmd and click once on the image thumbnail of the Aviators layer to create a selection. Go to Select > Modify > Contract. Keep a 4 px contraction and press OK.
Click on the Foreground Color swatch at the bottom of the toolbar and enter RGB values of 70/231/255. 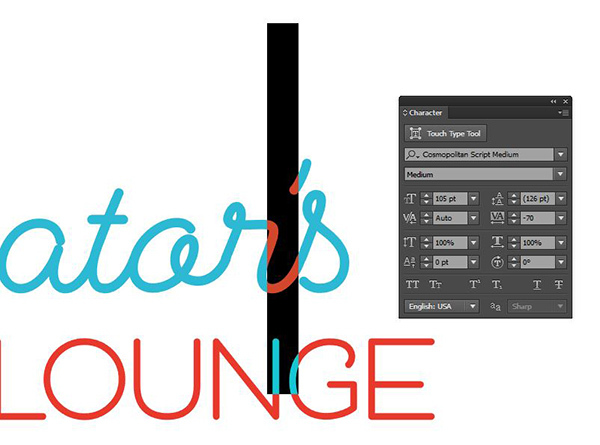 Make sure you have the Aviators Highlight layer active in the Layers palette, then press Opt + Backspace. Press Cmd + d to Deselect. 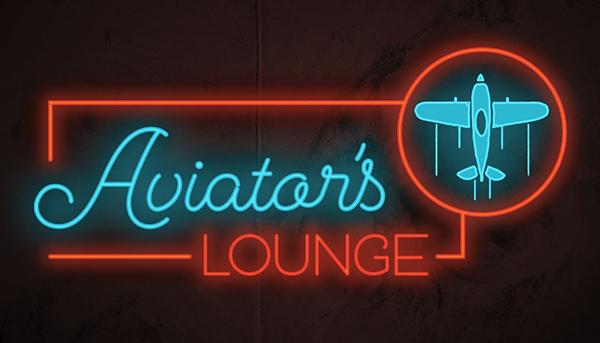 The plane will get a slightly different treatment to more accurately represent neon lighting. 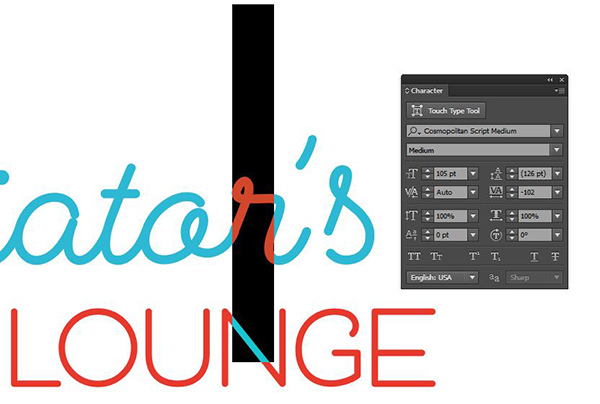 In the Logo group in the Layers palette, click on the Plane logo to make it active. At the bottom of the Layers palette, click the FX icon and choose Stroke. In the Layer Style pop-up, enter a Size of 6 px and Position of Inside. Click on the Color thumbnail, then use the Eyedropper to sample the bright teal Foreground color. Press OK. In the Layers palette, select the Black Fill layer to make it active, then press the Create A New Layer icon. Name the new layer Teal Glow. At the bottom of the toolbar, click the Foreground color swatch to bring up the Color Picker, then use the Eyedropper to sample the original darker teal from the logo. 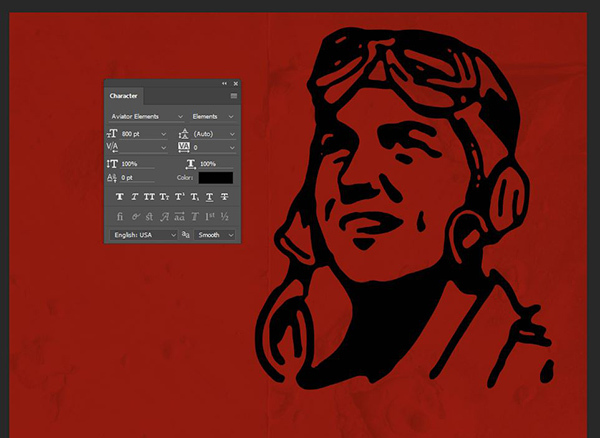 In the Logo group, hold Cmd and click on the image thumbnail for the Plane layer. 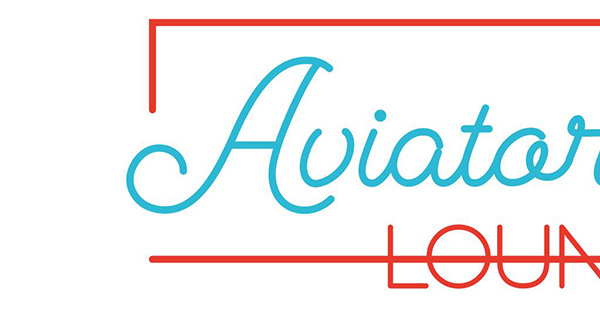 Hold Shift + Cmd and click on the image thumbnail for the Aviators layer. Go to Select > Modify > Expand. In the pop-up, enter 20 px and press OK.
Next, go to Select > Modify > Feather. Enter a Feather Radius of 50 px and press OK. In the Layers palette, make sure the Teal Glow layer is active and press Opt + Backspace, then press Cmd + d to Deselect. At the top of the Layers palette, change the Opacity to 50%. Click the Create A New Layer icon. Name the new layer Red Glow. At the bottom of the toolbar, click the Foreground color swatch to bring up the Color Picker, then use the Eyedropper to sample the original darker red from the logo. In the Logo group, hold Cmd and click on the image thumbnail for the Logo Outline layer. Next, go to Select > Modify > Feather. Enter a Feather Radius of 20 px and press OK. 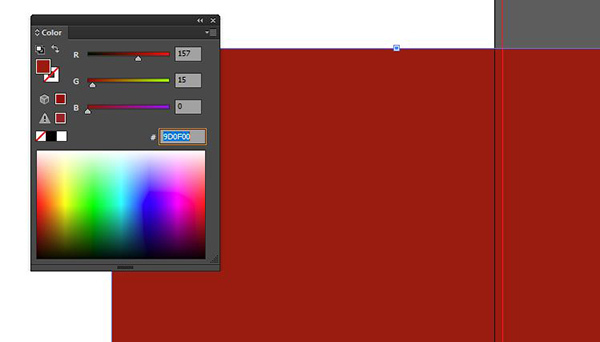 In the Layers palette, make sure the Red Glow layer is active and press Opt + Backspace, then press Cmd + d to Deselect. Click on the Black Fill layer, then click the Create A New Layer icon. Name the new layer Extra Color. We’ll use this layer to punch up the colored glow effect. Select the Brush Tool (b). Press the left bracket key ([) several times to reduce the brush size to 125 px. At the top of the artboard, change the Opacity of the brush to 100%. 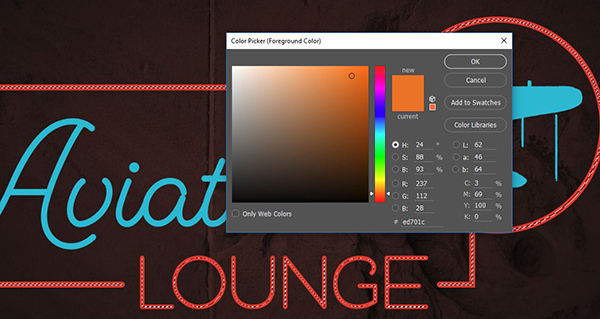 At the top of the Layers palette, change the Blend Mode to Multiply. Manually brush along the red areas of the logo. Change your Foreground Color to original darker teal from the logo. 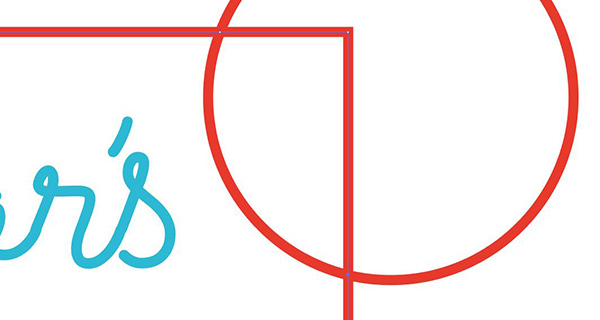 Manually brush along the teal areas of the logo. Our last touch will be to add some shadows between the neon and the glow it’s creating. In the Logo group, select the Logo Outline layer. 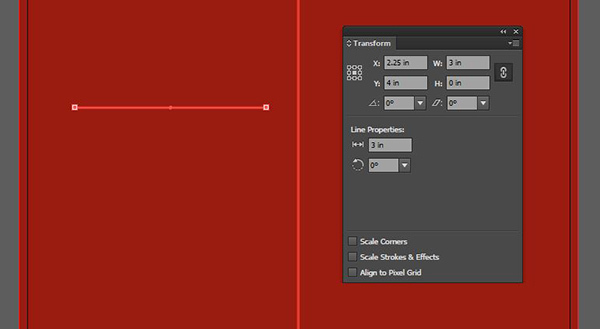 At the bottom of the Layers palette, click the FX icon and choose Drop Shadow. Keep the Blend Mode of Multiply and the color as black. For Opacity, enter 60%. Change the Angle to 45 degrees. For Distance, enter 6 px, Spread of 0% and Size of 25 px. Then press OK.
Now we’ll copy this effect to the Aviators and Plane layers. In the Logo group in the Layers palette, hold Opt and click on Drop Shadow under Logo Outline/Effects, then drag up to the Aviators layer. This will copy the effect to the Aviators layer. Repeat for the Plane layer – hold Opt and click on Drop Shadow under Logo Outline/Effects, then drag up to the Plane layer. And that completes this side of the menu! Now we’ll move on to the actual menu items for the content side. 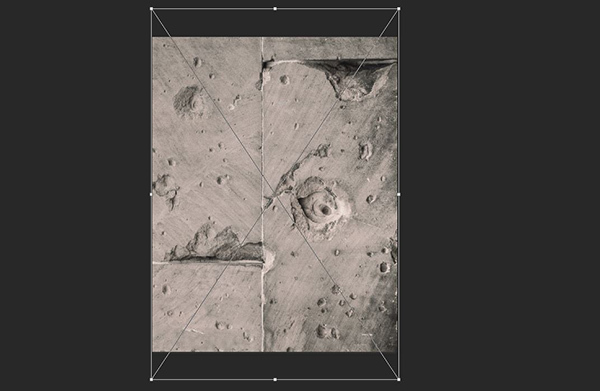 In the Layers palette, select the layer with the concrete texture image. Go to Layer > Duplicate Layer. In the pop-up dialog box under Destination/Document, choose New and name the file. Press OK.
At this point, it’s safe to close the other Photoshop file with the neon logo. 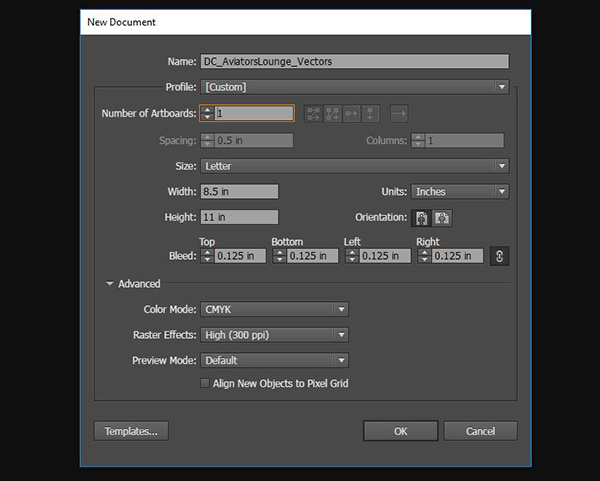 In the new document at the bottom of the Layers palette, click the Create A New Layer icon. Name the new layer Background and drag it below the concrete image. At the bottom of the toolbar, click the Foreground Color swatch. In the Color Picker pop-up, enter RGB values of 157/15/0. 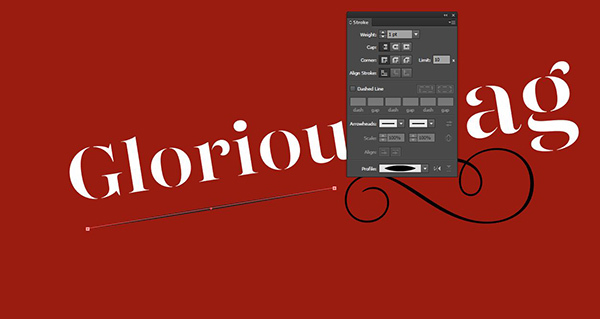 Press Opt + Backspace to Fill the Background layer with the dark red color. Select the concrete image layer. At the top of the Layers palette, change the Blend Mode to Multiply and the Opacity to 20%. Select your Type Tool (t). Click once on the artboard and type a lowercase d.
Switch to the Move tool (v). 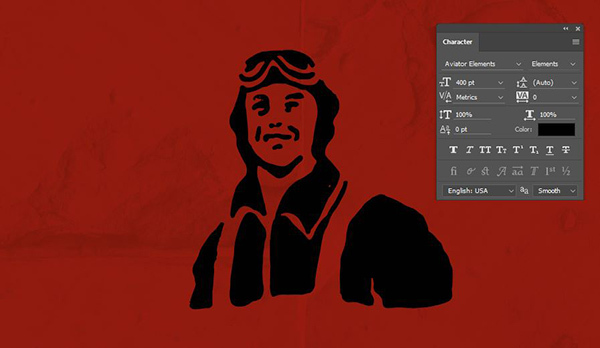 In the Character palette, change the font to Aviator Elements at 400 pt. 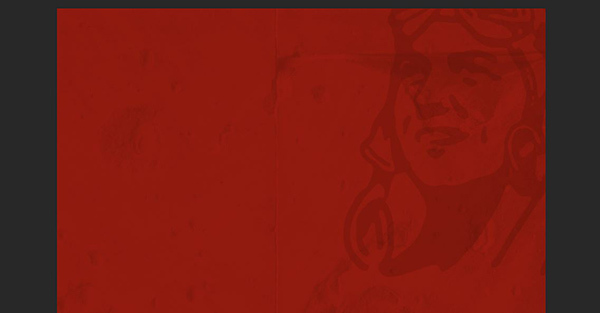 Position in the bottom left corner of the artboard. At the top of the Layers palette, change the Blend Mode to Multiply and the Opacity to 15%. Select your Type Tool (t) again. Click once on the artboard and type a lowercase e.
In the Character palette, change the font to Aviator Elements at 800 pt. Position in the top right corner of the artboard. At the top of the Layers palette, change the Blend Mode to Multiply and the Opacity to 15%. 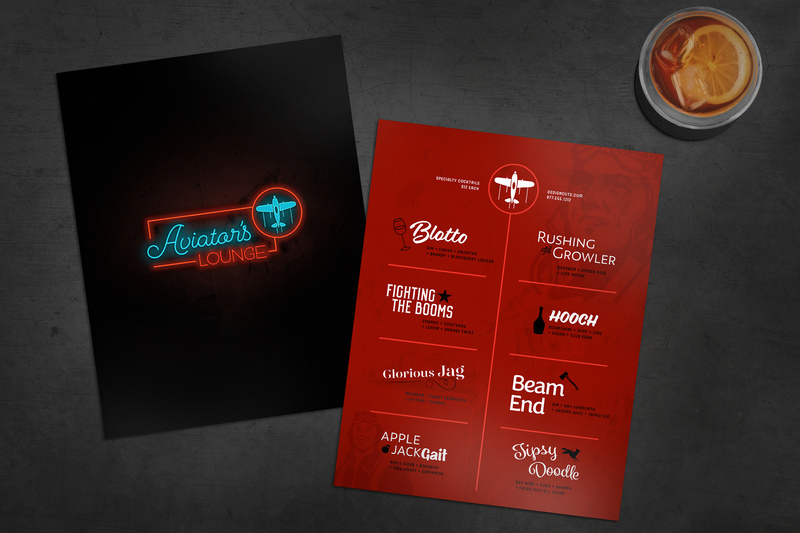 We’ll move back into Illustrator to lay out the content section of the menu. 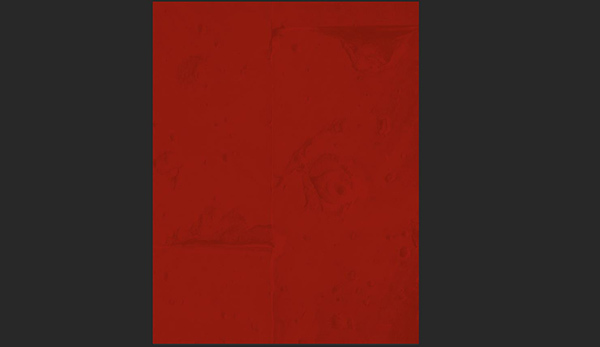 Afterward, we’ll bring it into Photoshop to lay it on top of our red background. 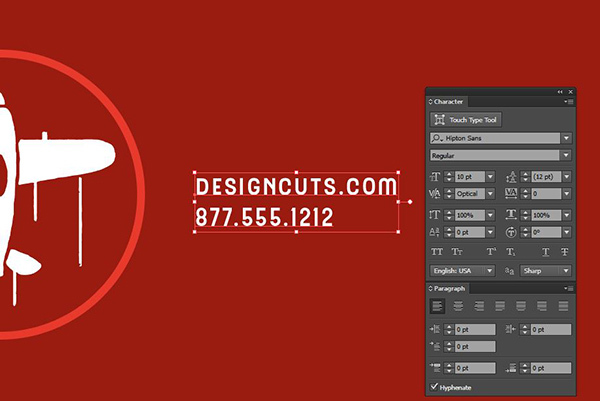 In the open file in Illustrator, press Cmd + a to Select All, then drag the entire logo to the side, off the artboard. Select the Rectangle Tool (m). Click once on the artboard and enter a Width of 8.75 inches and a Height of 11.25 inches, then press OK. In the Color palette, enter RGB values of 157/15/0 for the Fill color. Open the Align palette (Window > Align). Under Align Objects, select the icons for Horizontal Align Center and Vertical Align Center. Open the Layers palette (Window > Layers). 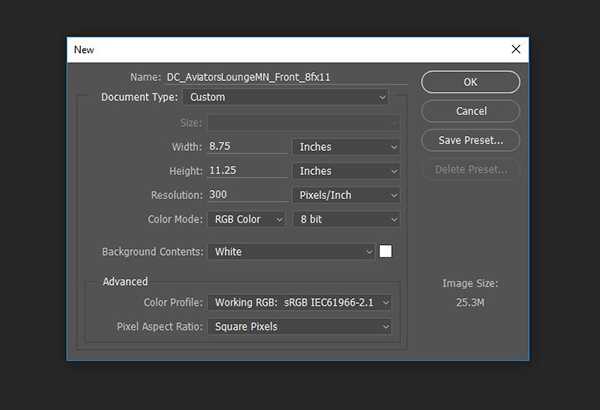 Double click the layer name, Layer 1, and rename it Background. At the bottom of the Layers palette, click the Create New Layer icon. Rename this layer Content. Switch to your main Selection Tool (v). Click once on the plane icon from the logo, then hold Shift and click the red circle. With both selected, press Cmd + c to Copy. In the Layers palette, select the Content layer, then press Cmd + v to Paste. Drag the copy to the top of the artboard, about a half an inch from the top. In the layers palette, next to the Background layer, click the empty space between the eye icon and the layer thumbnail to lock the layer. Select the plane icon. In the Swatches palette, change the Fill Color to white. Press Cmd + g to Group the plane and circle together. Open your Align palette and under Align Objects, select the icon for Horizontal Align Center. In the Character palette, change the font to Hipton Sans at 10 pt. In the Paragraph palette, choose Align Left. Lastly, change the Fill color to White in the Swatches palette. Position to the right of the plane/circle, vertically centered. Hold Shift + Opt, then click on the text we just created and drag to the left to create a copy. In the Paragraph palette, select Align Right. Position the text to the left of the plane/circle, the same distance from it as the text on the right. Select the Line Segment Tool (\). Click once on the artboard. In the dialog box, enter a Length of 8.5 inches and an Angle of 270 degrees. Press OK. Select the Eyedropper Tool (i) and sample the red circle. This will give us the correct color and Stroke weight. Use the Move Tool (v) to position the line so it intersects the bottom edge of the circle. In the Align palette, select Horizontal Align Center. Select the Line Segment Tool (\) again. Click once on the artboard and enter a Length of 3 inches and an Angle of 0, then press OK.
Open the Transform palette (Window > Transform). Enter an X Value of 2.25 inches and a Y Value of 4 inches. Go to Object > Transform > Move. In the dialog box, enter a Horizontal Position of 0, a Vertical Position of 2.25 inches and press Copy. We’ll duplicate the last action by pressing Cmd + d.
Use the Move Tool to drag across the three short, red lines on the left side of the artboard. With all three selected, go to Object > Transform > Move. Enter a Horizontal Position of 4 inches and press Copy. 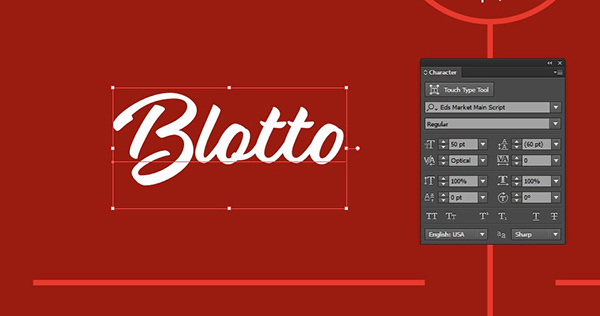 Select the Type Tool, click once on the artboard and type: Blotto. In the Character palette, change the font to Eds Market Main Script Regular at 50 pt. In the Swatches palette, change the Fill Color to white. In the Paragraph palette, select Align Left. Position in the top left square of the grid. In the Character palette, change the font to Hipton Sans Regular at 10 pt. 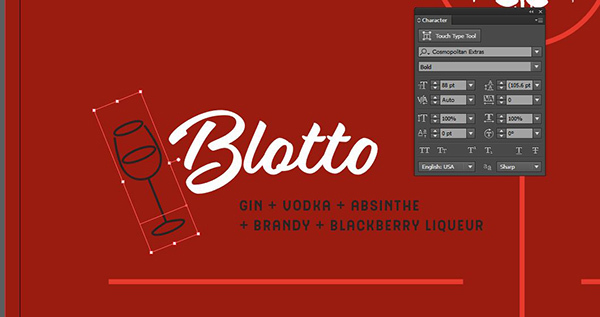 Select the Type Tool, click once to the left of Blotto and type an uppercase L.
In the Character palette, change the font to Cosmopolitan Extras Bold at 88 pt. Go to Object > Transform > Rotate. In the pop-up dialog box, enter an Angle of 22 degrees, then press OK. 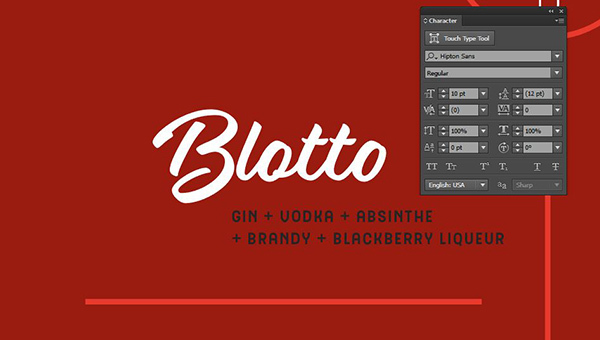 Position to the left of Blotto. 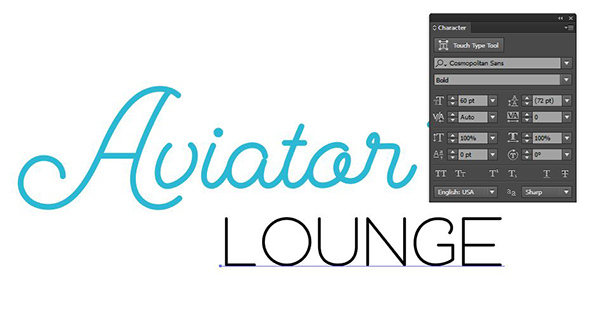 In the Character palette, change the font to Aviator Regular at 38 pt. Set the Leading, the space between lines, to 31 pt. Place the cursor before The Booms and press the spacebar twice to offset the second line. In the Swatches palette, change the Fill Color to white. Select the Type Tool, click once on the artboard and next to Fighting, type a lowercase d.
In the Character palette, change the font to Assemblage Ornaments at 160 pt. In the Character palette, change the font to Gabriela Stencil Bold at 26 pt. 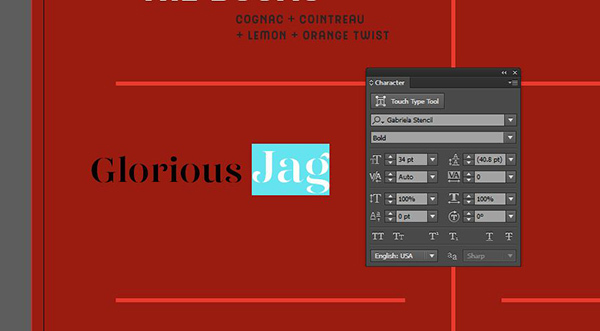 Use the Type Tool to select just the word Jag. Increase the font size to 34 pt. Go to Object > Transform > Rotate and enter 9 degrees, then press OK. 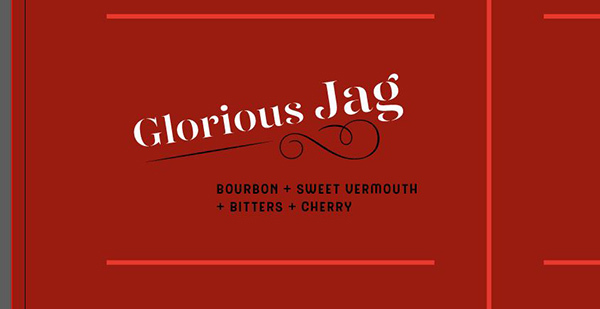 Select your Type Tool, click on the artboard below Jag and type a lowercase v.
Change the font to Assemblage Ornaments at 33 pt. Go to Object > Transform > Rotate. Enter -2 degrees and press OK. Position under Jag. Select the Line Segment Tool (\). 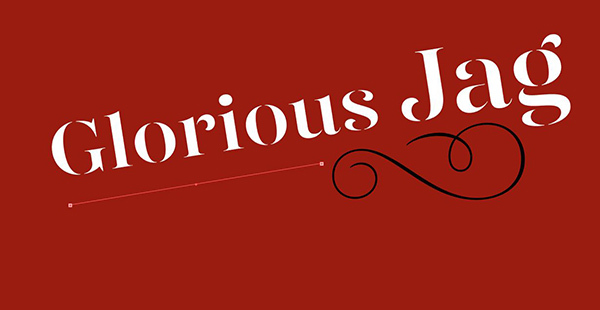 Click to the left of the ornament and drag out to the left to the beginning of the word Glorious. In the Swatches palette, add a Stroke color of black. In the Strokes palette under Profile, choose Width Profile 1. 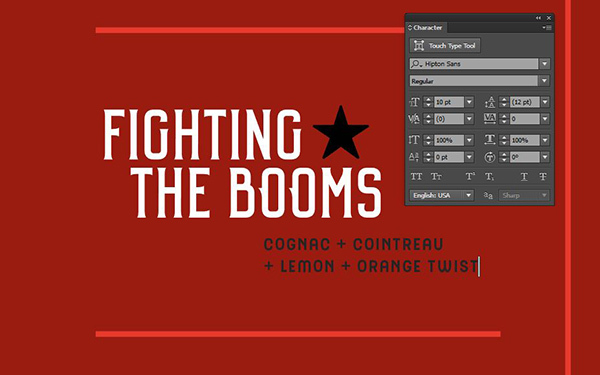 With the Selection Tool (v), hold Opt, then click and drag down on the ingredients under Fighting the Booms (Cognac + Cointreau + lemon, etc). Position below Glorious Jag. 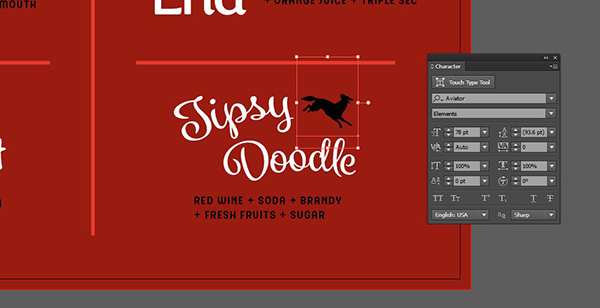 In the Character palette, change the font to Malva Regular at 27 pt and set the Leading to 27 pt. 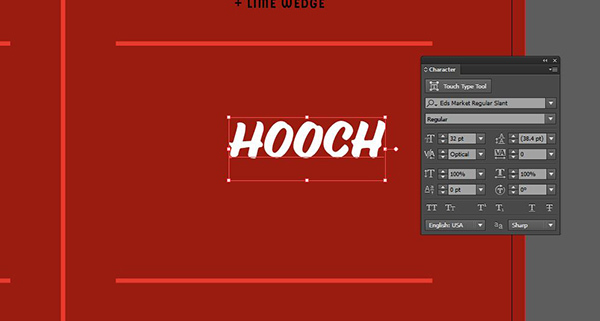 Use the Type Tool to select just the word Gait. Change the font to Eds Market Regular at 34 pt and set the Baseline Shift (in the Character palette) to -2. Lastly, place the cursor in front of JACK and add 4 spaces to offset the second line. Select your Type Tool, click on the artboard to the left of JACK and type a lowercase w.
Change the font to Assemblage Dingbats at 33 pt. 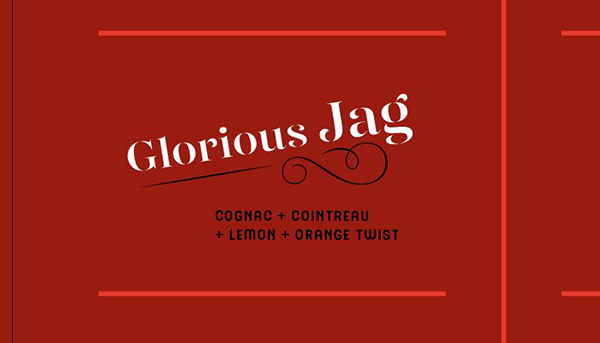 With the Selection Tool (v), hold Opt, then click and drag down on the ingredients under Glorious Jag. Position below Applejack Gait. In the Character palette, change the font to Assemblage Regular at 35 pt. Decrease the Leading to 30 pt. In the Swatches palette, change the Fill Color to white. Position in the top right square of the grid. 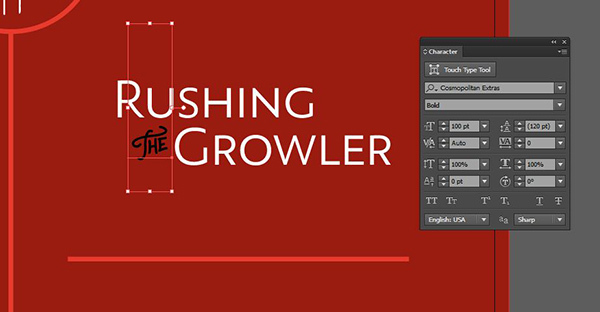 Click once on the artboard with the Type Tool to the left of Growler and type a lowercase c.
Change the font to Cosmopolitan Extras Bold at 100 pt. Select the main Selection Tool. 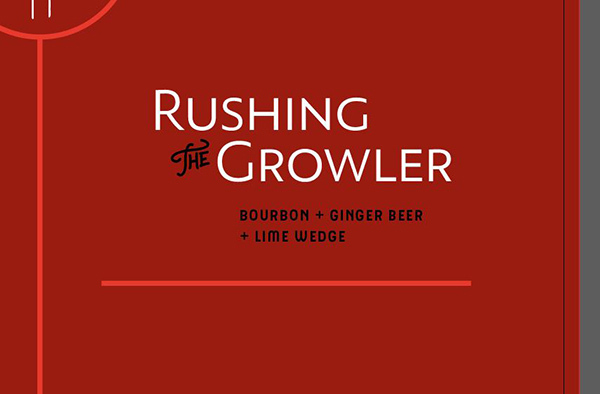 Hold Opt, then click on the ingredients list under Blotto and drag to the right to make a copy under Rushing the Growler. In the Character palette, change the font to Eds Market Regular Slant at 32 pt. Select the main Selection Tool. 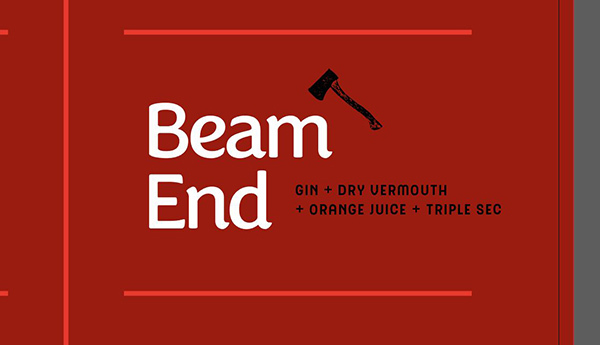 Hold Opt, then click on the ingredients list under Fighting the Booms and drag to the right to make a copy under HOOCH. 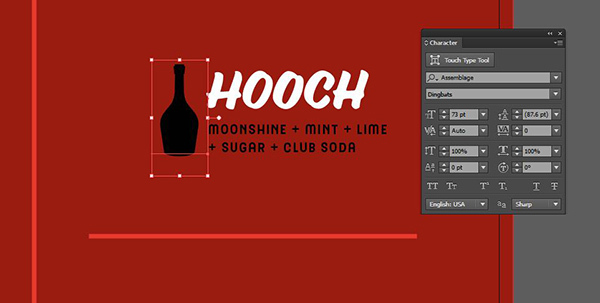 Switch to the Selection Tool, then back to the Type Tool and click to the left of HOOCH. Type a lowercase g. Change the font to Assemblage Dingbats at 73 pt. In the Character palette, change the font to Congenial Regular at 50 pt. Decrease the Leading to 44 pt and decrease the Tracking, the space between letters, to -50. Select the main Selection Tool. 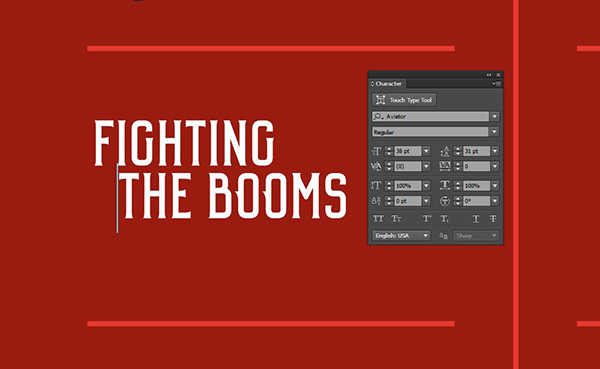 Hold Opt, then click on the ingredients list under Fighting the Booms and drag to the right to make a copy to the right of End. 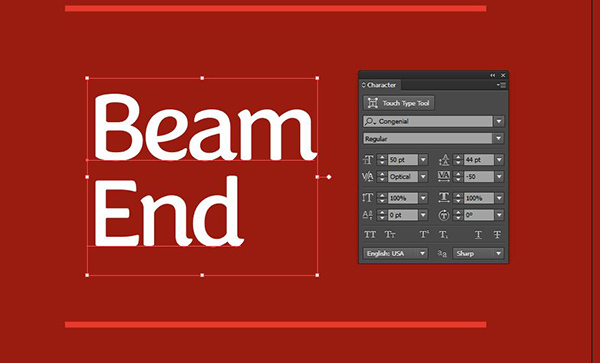 Switch to the Selection Tool, then back to the Type Tool and click to the right of Beam. Type an uppercase A. 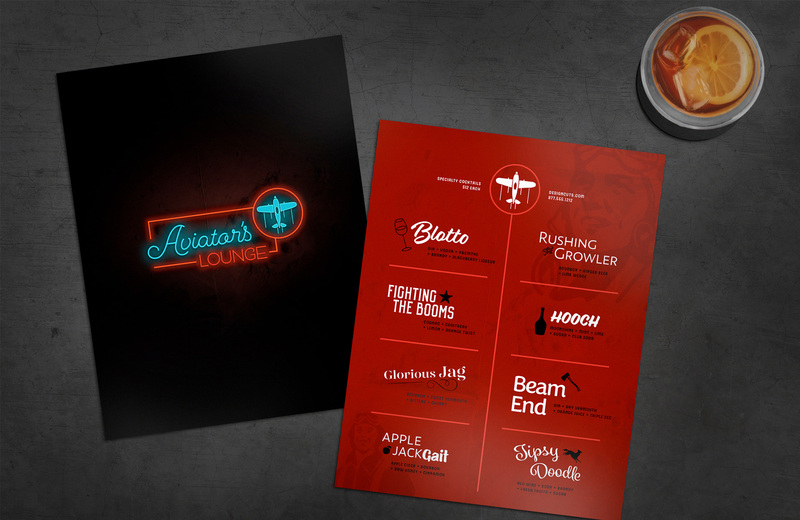 Change the font to Aviator Elements at 92 pt. In the Character palette, change the font to Spumante Regular at 40 pt. Decrease the Leading to 46 pt and decrease the Tracking to -25. In the Swatches palette, change the Fill Color to white. Position in the bottom right square of the grid. Go to Effect > Warp > Arc. Enter a Horizontal Bend of 20% and press OK.
Now go to Object > Transform > Rotate. In the dialog box, enter a rotation of 8 degrees and press OK. Select the main Selection Tool. 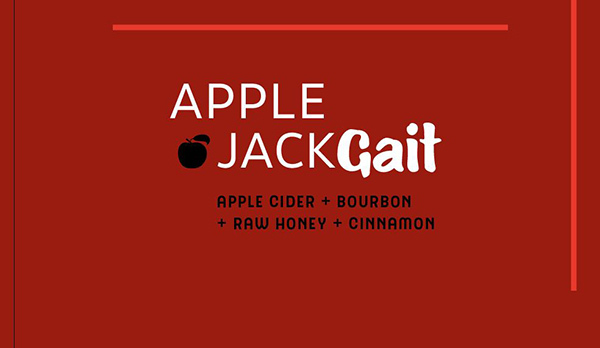 Hold Opt, then click on the ingredients list under Applejack Gait and drag to the right to make a copy below Doodle. 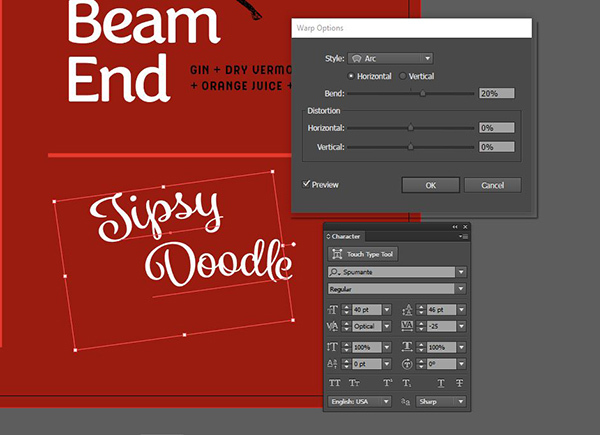 Switch to the Selection Tool, then back to the Type Tool and click to the right of Tipsy. 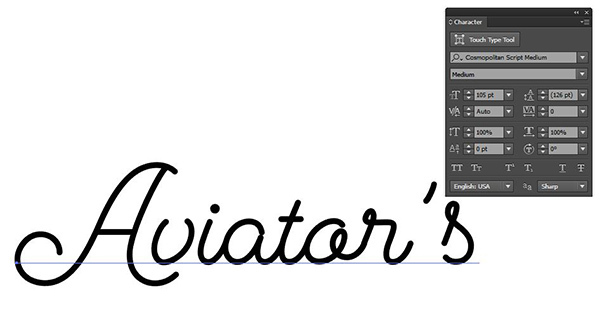 Type an uppercase P. Change the font to Aviator Elements at 78 pt. Last step! Press Cmd + a to Select All. Press Cmd + c to Copy. Go back into the red file we made earlier in Photoshop and press Cmd + v to Paste. Choose Smart Object and press OK. Press Enter to complete the placement. And we’re done! 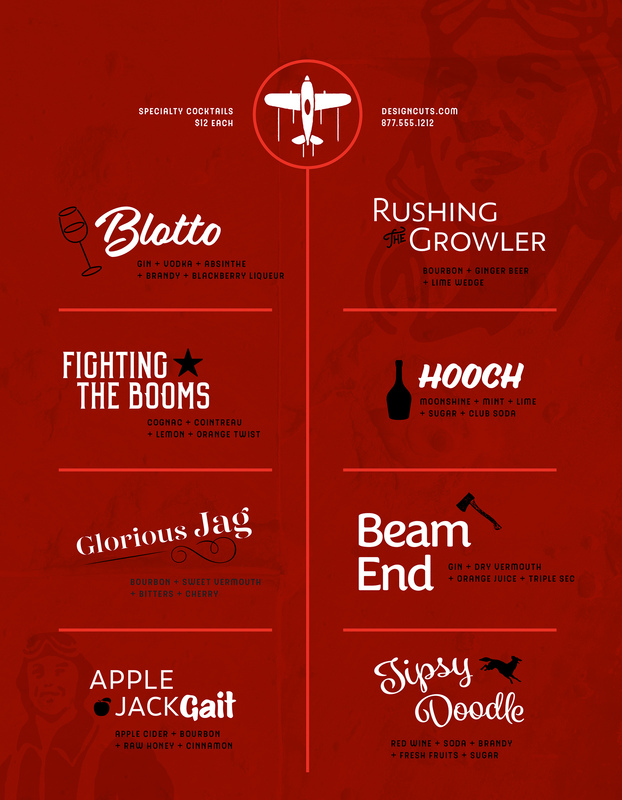 We’ve created a fun specialty cocktail menu using a ton of interesting fonts and ornaments plus a snazzy neon effect. 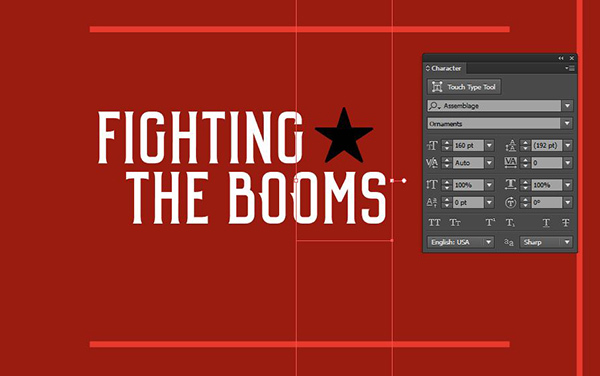 There’s still time to check out The Definitive Font Selection of big hitting, impactful font families for only $29. Nice tutorial, Thankyou 🙂 I used a brick background instead and it came out well. Thank you so much for your kind words! We’re so pleased to hear you enjoyed this tutorial 🙂 We would love to take a look if you ever wanted to share your work? Thank you so much for letting us know about this. I am so sorry for any inconvenience caused with this link! We’ve just double checked this and there was a small mix up on our side but rest assured, we’ve fixed this now and everything should be running smoothly again 🙂 I can also see that Su has very kindly sent a link to this item in the comments as well (thanks, Su!). Apologies again for any inconvenience, Andrea! We hope you enjoy this tutorial and if you have any other queries please do let me know! This is why DESIGNCUTS is the best. Not only is this great marketing in terms of timing and content, it’s great quality. You’re creating rock-solid continuity between content, education, and community, it’s just brilliant. Lots of work went into this tutorial, really well done. Thanks for all your hard work. Thank you so much for your incredibly kind words! We really appreciate it and we are so pleased that you are enjoying our tutorials and content 🙂 It means the absolute world to have you support. Thanks again for your lovely comment and if there is ever anything I could assist you with please do get in touch. I’m always happy to help!